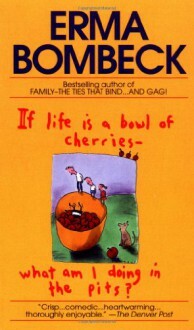 http://itsiest.booklikes.com Kari@ From the TBR Pile 3.0 If Life Is a Bowl of Cherries, What Am I Doing in the Pits? text If Life Is a Bowl of Cherries, What Am I Doing in the Pits? http://bitter13.booklikes.com ism 5.0 If Life Is a Bowl of Cherries, What Am I Doing in the Pits? http://anna3101.booklikes.com Ania's books 3.0 If Life Is a Bowl of Cherries, What Am I Doing in the Pits? The book is mostly about the life of a housewife, so I couldn't relate to it. However, some stories were really funny and those at the very end of the book almost make you cry. Yes, I actually read this. I was sitting in my basement about ten years ago, waiting for a friend to arrive in town. She took significantly longer than expected, so Erma Bombeck it was. I can't say I understood any of the humour but hey, I read the thing. http://surreysmum.booklikes.com A Scottish-Canadian Blethering On About Books 3.0 If Life Is a Bowl of Cherries, What Am I Doing in the Pits?